Dogs aren’t big fans of taking a long and relaxing soak in the bathtub, as anybody that has attempted to clean their canine will be well aware. This doesn’t mean that all dogs are mucky pups, however. The average hound will be perfectly content giving themselves a wash by licking every inch of their body that they can reach until we can’t stand the smell any longer and get them into the shower. Paws and feet are all part of the process of your dog’s self-regulated cleaning routine, but we need to be careful as pet parents. A dog licking their feet or paws to excess could be a warning sign that something is wrong with your pet, either physically or mentally. 1 Is My Dog Genetically Pre-Disposed to Lick Their Paws? 2 Why Does My Dog Keeping Licking His or Her Paws? 8 My Dog is Licking Their Paws All Night! Is My Dog Genetically Pre-Disposed to Lick Their Paws? However, just to reiterate, even if your dog’s breed is listed above, that doesn’t necessarily mean that paw licking is nothing to worry about and it can be ignored. As we’ll soon learn, there could be many reasons why your dog is acting in such a way. Why Does My Dog Keeping Licking His or Her Paws? 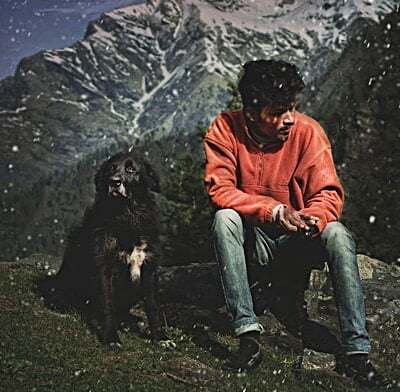 There are many reasons why Fido may take to licking his paws beyond the usual degree of personal hygiene, and we’re sorry to say that none of them are particularly good news. At best, your dog is living with an allergic reaction – and at worst, they may have a tumor of some description. They’re in Pain. Dogs like to lick themselves as an exercise in self-soothing, so if your canine is seemingly doing this more and more they are likely in some kind of physical discomfort. For example, Your dog has burned paws due to a red-hot pavement. Your Dog is Anxious. Just like licking and chewing paws can be soothing against pain, your dog may seek comfort from any anxious thoughts or moods by popping their paws into their mouths. This could become particularly problematic if your dog is prone to separation anxiety. Your Dog Has an Allergic Reaction. This might be an allergic reaction to food, to a new carpet cleaner that you have laid down, to something found in the grass of the local park… your vet should be able to pinpoint the precise culprit. Your Dog is Bored. Canines can’t just switch on Netflix or pick up a magazine when they’re bored, so they find ways to amuse themselves that we find a little strange. If they are not getting enough stimulation or exercise, they may chomp on their paws. Your Dog Has an Imbalance of Hormones. There are two major medical concerns related to hormones within dogs. Cushing’s disease tends to create an excess of the stress hormone cortisol, while hypothyroidism sees insufficient levels of the thyroid hormone being created. Both of these conditions are serious and require the attention and advice of a vet, and both include excessive paw licking among their symptoms. Your Dog Has Dry Skin. An excess of sun exposure often causes dry skin for your furry friend, but perhaps surprisingly, too much bathing could be just as dangerous – especially if you’re using non-pet specific soaps. Your Dog Has a Tick or Flea Infestation. This is no joke for your dog, as parasites can cause huge problems for any animal. If your dog is still licking and biting after a treatment, or they start again after a pause of a few days, there may have been eggs laid within your dog’s fur that have now hatched. Your Dog Has Been Bitten by an Insect. It is common for a dog to be bitten by an ant on the foot or stung by a bee or wasp. Your Dog Has Walked on Ice or Salt. Cold weather can play havoc with a dog’s paws, and they’ll bring all kinds of souvenirs from a cold weather walk home with them. This could include salt or grit used to clear up ice and snow from the road. As you will see, there has been a common thread throughout most of these diagnoses. If your dog is licking their paw to excess, make an appointment with a vet. This is not a behavior that should be ignored in the hope that it will go away. No excessive paw licking is a good thing, but this is arguably the best possible scenario for your dog. If Fido is constantly licking at one paw, it suggests that he is experiencing pain and discomfort localized to that area. Very gently, take a look at your dog’s paw in this instance – if they’re reluctant to let you, it adds fuel to the theory that there is some kind of problem here. This may be a blister or a splinter, a sting from a bee or wasp, maybe some residual pain from trotting through a stinging nettle. Just because we have considered this the best of a bad set of situations, however, it doesn’t mean that a dog licking just one paw is not a problem. Get them to a professional for a thorough examination – your dog is licking because they are in pain, and only a vet can soothe that discomfort for them. If your dog is licking their paws raw, you may have a serious problem on your hands. This suggests that they are compelled to continue licking and biting beyond the point of relief, and even pain. Instead, your dog has a psychological problem in addition to a physical one. As we suggested above, your dog is most likely experiencing anxiety. This could be a result of being left alone for too long, or your dog may just live with generalized anxiety. If you’re worried about your pooch and their paw-chewing habit, do what you can soothe their troubled hearts and minds and ease their anxiety. 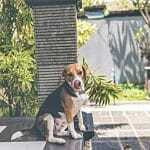 Ensure that your dog trusts you completely, and everybody else that lives within your home, implicitly. It also helps to give your dog plenty of physical attention when they allow it – just like humans, dogs feel better after being touched and reassured! Create an aromatherapy spray that fills the room or a liquid that you can dab behind your dog’s ears, to calm them down. Consult a vet before attempting this in case your dog has any kind of allergies, but some of the herbs and oils that you could use include Lavender, Jojoba, Aloe Vera, Sweet Orange, Ylang Ylang and Neroli. Try crate training your dog. If they feel that they have somewhere that they can go where they feel safe and happy, their anxiety is likely to become far more manageable. Give Fido plenty of exercise. If your pooch can get some of those lovely endorphins flowing, they’ll feel amazing – and are far less likely to be fearful about what the world has to offer! If your dog is limping, it usually means that they are in some degree of pain. This could stem from their paw or paws, or it may be something more permanent and medical in nature, such as arthritis. 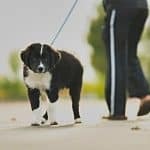 Get to a vet as soon as you can if you notice your dog limping for anything more than a few seconds at a time, as it suggests that they are suffering. If they are licking their paws as well, it is fair to assume that they are trying to soothe themselves and feel better. If your pooch is particularly unlucky, they may have torn a muscle, or even developed a tumor. One other possible reason why a dog could lick their foot and limp is the presence of a foreign object in the padding of their paws. In a best-case scenario, this is something like a small stone or pebble that had become lodged within Fido’s foot, or maybe even a small splinter. If you can remove these objects with a pair of tweezers, keep a careful eye on your pooch and double-check that both symptoms – the licking and the limping – have subsided. This is a common problem for many dog owners, especially when allergy season is in full swing. 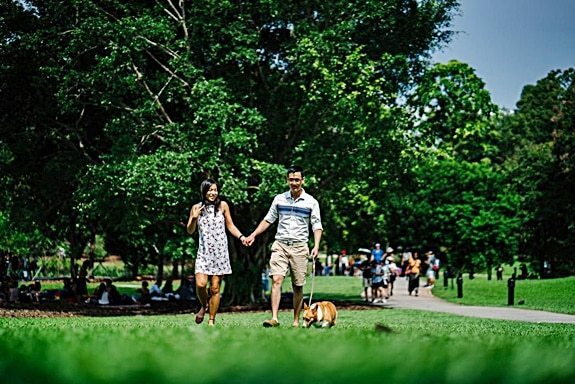 Dogs that go strolling and running through parks and fields will potentially be subjecting themselves to a variety of different allergies, which will then lead to paw-licking in an attempt at easing the discomfort. If your dog is licking their paws after taking a walk, take a look at the feet in question. You may find that there is something trapped in the paw such as a stone or stick that has caused a splinter. If no sign of such a foreign object, it suggests that Fido is suffering from something invisible to you – but hugely irritating to him. Consult a vet before this problem goes any further; your pooch is in pain! Taking your dog out for a walk when the sun is at its peak in the summer months can be hugely dangerous. Dog paws can blister and burn if exposed to such unrelenting heat, which can lead to all kinds of discomfort – and excessive licking to ease the pain. Remember the three-second rule when considering taking your dog out for a summer stroll. Place the back of your hand on the street or asphalt, and hold it for three seconds. If it’s too hot for you to cope with, then it’s too hot for your dog to be able to comfortably walk on and not run into trouble. Taking your dog out for walkies in the winter months can be a particularly challenging time for Fido. Dogs still need their exercise when the ice and snow arrives, but it can be a fraught time. If you are walking through streets that have been gritted or had salt laid down on them, be vigilant – this will irritate the pads of your dog’s feet and likely get stuck within the pads. This, in turn, will lead to your dog licking and biting at their unwelcome infiltrators and potentially ingesting something very dangerous. Even ice and snow are problematic, as this can get stuck between your dog’s toes. If the weather is particularly cold, consider investing in a pair of socks or booties for your pooch. If they don’t allow you to place these upon them, however, always make sure you keep a bowl of warm water and a towel or hairdryer by the door to get those paws nice and toasty when you get home. Dogs can sometimes be prone to developing fungal infections between the toes, or on the webbing of their paws. The scientific terminology of this condition is Interdigital Furunculosis. If a vet diagnoses your dog as living with an infection that is not a result of, they will more than likely diagnose an antifungal and antibacterial cream or steroidal spray that will prevent inflammation from taking root. These remedies are often shared with humans and can be purchased over the counter at a drugstore, or a prescription-strength cream may be required. If the problem is more severe, your vet may need to prescribe oral medication. Either way, ensure you consult a professional at the first sign of any such issues. Regular bathing of your dog’s paws in warm water with baking soda, Epsom salt or povidone iodine will also help keep the problem at bay. Just be sure to dry your dog’s paws thoroughly afterward, and use a moisturizing oil. My Dog is Licking Their Paws All Night! A dog that seems besotted with bathing once the sun goes down and everybody is keen to catch some sleep is a common problem, but thankfully, it makes our canine’s behavior easier to diagnose. If your dog seems mostly indifferent to their own paws all day but starts licking and biting at bedtime, the chances are they are experiencing an allergic reaction to your bed – or their own. Change the laundry detergent that you use, give any blankets and sheets a thorough wash, and stop to consider any nocturnal routines that use a particular scent or leave a trace that could be triggering the reaction. 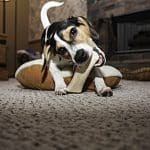 There is one simple possible explanation for why your dog insists on cramming their paw into their mouth; they’re aware that their claws are too long, and there are trying to bite them down. Dogs may not gnaw on their nails when their favorite basketball team is one hoop and three seconds away from a major victory or before a first date, but they do try to manage their length where possible. This is something of a Catch-22 for dogs. Many, many canines flat-out refuse to allow anybody to trim their claws, pitching a fit whenever somebody attempts to do. Left untrimmed, however, claws can twist and curl inward, which leads to Fido’s toes becoming misshapen and leading to pain every time they take a step. As troublesome as it may be, you need to ensure that your dog is making regular trips to a groomer to get those troublesome claws trimmed. It’ll be torturous, and the groomer may end up looking as though they fought twelve rounds of combat with a straight razor, but that’s what they’re paid for! Unfortunately, simply walking on a number of tough surfaces is not enough to wear down stubborn claws and ensure safety for your pet. 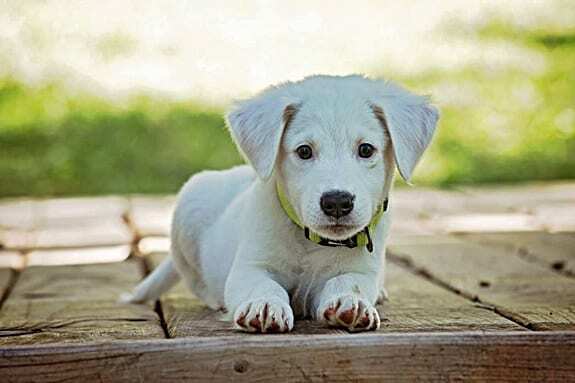 Paws and lower legs are very easy pickings for many fleas and ticks, as these parasites manage to attach themselves to a canine appendage with a minimum of fuss. The result is a huge amount of discomfort for your dog, as they are constantly itching, scratching and generally feeling unhappy with their lot in life. You should keep up-to-date with your dog’s flea and tick prevention treatments anyway, as this is all part of being a responsible pet parent. Despite all our best attempts at preventing our dogs from becoming a snack for bloodsucking parasites, however, they often still make their way aboard. 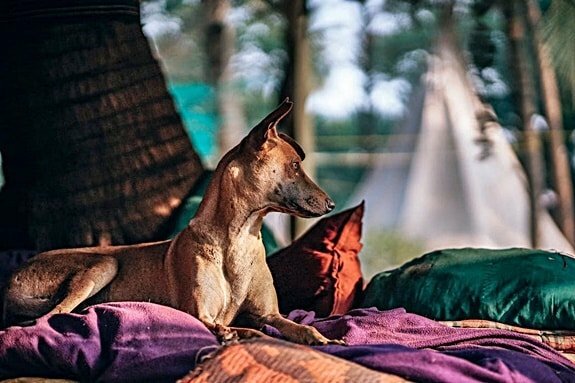 If you spot an infestation on your dog, fumigate your entire house with an anti-flea treatment or spray and give ever blanket, bed sheet or cushion that your dog may have populated. Any of these locations could be a breeding ground for flea eggs, and a scorched earth policy is the only way to be sure that you won’t experience a revisit. Dry skin can be a huge problem for dogs that leads to them licking their paws in search of relief – not least because every inch of their body will start to itch in such a situation. To help your dog avoid suffering from this unpleasant affliction, use an oil or lotion to keep their skin from becoming dehydrated. Coconut oil can be particularly effective for this, in addition to having a long list of other health benefits for any dog, or olive oil will also do the trick. If you live in a particularly hot climate you may also want to consider adding a dehumidifier to your home, allowing your dog’s skin to reap the benefits of cool, moist air. As we have suggested earlier, however, don’t make the mistake of continually washing your dog on the assumption this will keep their skin moist. A dog’s coat is naturally self-cleaning, and shampoos and conditioners that are loaded with perfumes and other additives can wreak havoc on sensitive skin. Try to avoid the temptation to wash your dog’s body more than once a week at most (though it’s advisable to wash their paws as frequently as possible). Your dog’s diet may also be causing dry or itchy skin, especially of your pooch dines on kibble for every meal. This is particularly prevalent with the lower-quality dog foods available from supermarkets, as they can often leave your canine with a vitamin deficiency. If you must serve dry food, consider adding a little chicken or beef broth to bring more joy to your dog’s mealtimes. The first thing that you’ll need to do is confirm whether your dog’s tendency to lick his or her paws stems from a medical concern, a behavioral/psychological problem, or it’s just a one-off due to a foreign object being embedded within the foot. You’ll need the assistance of a vet or some other kind of animal healthcare professional for this – don’t rely on guesswork. 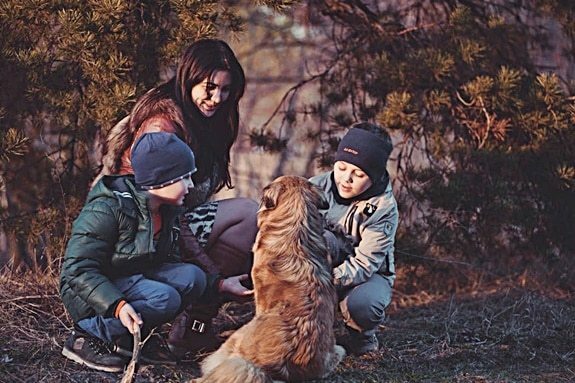 If you discover that your dog is bored, then step up their exercise routine and introduce some games at home to improve their stimulation. This should eradicate the issue and prevent it from continuing any further, and you’d be amazed at just how much difference changing up a routine can make. If your dog is prone to anxiety and you believe that to be the cause of their paw licking, try the homeopathic remedies that we discussed – or even consider adding a couple of drops of Rescue Remedy to their water bowl. If there appears to be an allergy at the root of the problem, change your dog’s diet (gradually and gently – you don’t want to swap paw licking for diarrhea by placing your dog’s stomach in shock!) or switching our your fabric conditioner. You can also use an over-the-counter human remedy such as Benadryl to combat allergic flare-ups. If the problem is purely psychological, you could also make your dog’s paws taste considerably less appealing to a pooch palate. Washing your dog’s feet with regularity is a great habit to get into as it will help combat the risk of fungal infections, and afterward, you could spray something non-toxic but bitter-tasting (lemon juice or apple cider vinegar, for example) to deter the otherwise-appealing notion of licking away at the fur on the foot! Naturally, don’t use these substances if your dog has an open wound on their paw, though. There’s just one final opportunity to explain that a dog licking his or her own paw is typically a sign that something is wrong. We’re talking within the realm of reason here, and are not saying that you should rush to the vet if your pooch is taking a bath at the bottom of the bed and reaches their toes. If you notice a repetitive or obsessive behavior, however, seek help. Your furry friend will thank you for it in the longer term.